The days are slipping by so quickly that we're already into October half-term and three quarters of the way through the awareness month for Selective Mutism called ‘Make a Noise for Selective Mutism Awareness,’ #Makeanoise4SM. We have struggled with SM-like symptoms in our own family with Son2, as although his diagnosis is Asperger's/ASD, anxiety and sensory overload can cause him to "freeze". In fact, it's believed that this symptom crossover can cause a risk of misdiagnosis. However, Selective Mutism is a condition in its own right and SMiRA (Selective Mutism Information & Research Association) describes Selective Mutism, sometimes called Situational Mutism, as an anxiety-based mental health disorder, which usually commences in early childhood. SMiRA offers support to families and health and education professionals involved in the care of selectively mute children. It runs a very active facebook group and a website at www.smira.org.uk. Selective Mutism affects at least 1 in every 150 children, and is three times as common in bilingual children, however is relatively unheard of. Those affected are able to speak freely in familiar circumstances such as with family in the home, but will remain consistently silent in others, perhaps exhibiting a blank expression or appearing ‘frozen’ when expected to speak. SM usually begins in children under five years of age, though it may only become noticeable when the child begins to interact outside the family circle, such as within the school setting. This condition prevents children from interacting and learning normally at school – which can be debilitating and detrimental to their lives and to their family. With early intervention, recovery is effective, but in some instances it may persist and last as long as adulthood. SMiRA, aims to raise awareness and funds to provide much needed training opportunities, particularly for health and education professionals and anyone who may be involved in the care and welfare of selectively mute children. Peter has Selective Mutism and his mum, Helen Andrews, has written for us about his struggles with SM. Despite his difficulties with talking, Peter still manages to take part in regional gymnastics and has plenty of medals to show for it! Imagine being nine years old and being a talented gymnast. You are part of a close knit squad of boys, whom you chat and laugh with. You are happy, cheeky and loud; you can compete in large competitions in front of crowds of people and enjoy the experience. That is until someone from outside your squad comes over to your group. It could be another coach, or even someone you know well and see on a regular basis. Then you become silent, unable to speak. No matter how hard you try, the words just won't come out. You start to feel panicky, your heart pounds, you feel frozen, stuck and unable to reach the outside world. As soon as that person leaves, you become 'unfrozen', the feeling passes and you are back to your happy, chatty self. 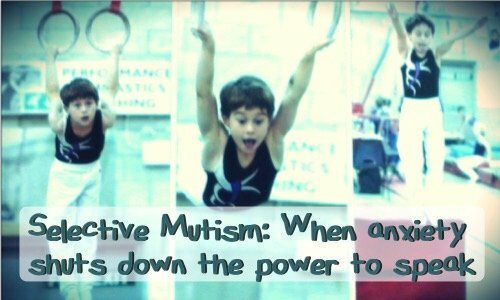 This is what daily life is like for my son, because he has a condition called Selective Mutism. He was first diagnosed when he was just three years old, but we, as his family, first noticed his symptoms when he was around 15 months of age and I started taking him to mother and toddler groups. My happy chatty, bouncy little boy would change to a withdrawn silent boy, the second we stepped out of the door. His eyes would go down, his face would become frozen and his body stiff and he would stay this way until we took him home again. I remember feeling completely perplexed by his behaviour and started to worry about what was wrong. At first, the diagnosis brought us nothing but puzzles; most people had never heard of Selective Mutism, and those professionals who had just said he would, 'grow out of it.' No one was willing to offer any help or support. He did start to make some progress at Preschool: after he had been there for nearly two years and it was nearly time for him to leave, he started talking to his key worker through a toy phone. He picked it up one day and just spoke, so she picked up the other one and spoke back, from that point on, he was quite happy to chat to her through the phone. He then progressed to speaking through puppets. Unfortunately, the time came for him to leave and start school. Peter was happy to go; he'd seen his older siblings go off to school each morning and so was looking forward to going himself. I had supplied the school with the little information I had on Selective Mutism and a copy of the letter of diagnosis. I was reassured that they would look after him and felt they understood. Peter, at first, had gone to school happily, he had made some friends and was quite settled, but only communicated by shaking or nodding his head. Then his behaviour at home began to deteriorate. He stopped sleeping and became resistant to doing anything, including his passion, gymnastics with his behaviour there becoming defiant and difficult. It was like he had lost all interest in life! Then one day, after a particularly difficult morning, Peter was late for school. While taking him in, I found out that he had been punished badly at school for not speaking and it was this that had caused the problems. When I got him home I asked him why he hadn’t told me what was happening. His response broke my heart, he said, “I thought I was naughty and I didn't want you to be cross with me too." Not long after this, Peter fell at gymnastics and severely broke his arm. Even though he was verbal there, he lay silent and never cried. He would shake or nod his head and would point to pictures they had in A and E in response to questions, but he never spoke, he just had silent, heart breaking tears. He had to have surgery to relocate his bones and have pins put in to secure them. He then had to stay in overnight. It was another demonstration to us that our lovely boy needed help, but I was still unable to find anyone to help him. Another upsetting moment was when a long-term friend decided she would no longer tolerate Peter’s silence and stopped Peter going to their house, even though he was best friends with her eldest child. So Peter lost his best friend, which completely devastated him. He became very upset and started to resent the fact that he struggles to speak to people. Out of sheer desperation, I typed Selective Mutism into Facebook and found SMiRA, which was the best thing that ever happened to us! For the first time ever I found a group of people, who not only understood, but were a wealth of knowledge. I decided to explain to Peter why he was having his difficulties, and we haven't looked back since. He became determined to overcome his problem, and after a few false starts, he has started taking control. He communicates using a whiteboard at school, but he has also started whispering to some of his friends. He will now read to his teacher, if she is sitting behind him and she remains silent throughout, and he is generally more outgoing and confident in himself. We still have a long way to go, and when Peter is upset, or tired, or feeling under the weather, he will regress. But, thanks to SMiRA and their wealth of knowledge and understanding the future is looking a lot more positive for Peter.